Messier 49 (also known as NGC 4472 and Arp 134) is an elliptical galaxy of some 160,000 light-years across, located about 56 million light-years away from Earth in the equatorial constellation of Virgo (the Virgin), 4.1° west-southwest of the star Epsilon Virginis. It is receding from us at approximately 981 kilometers per second. 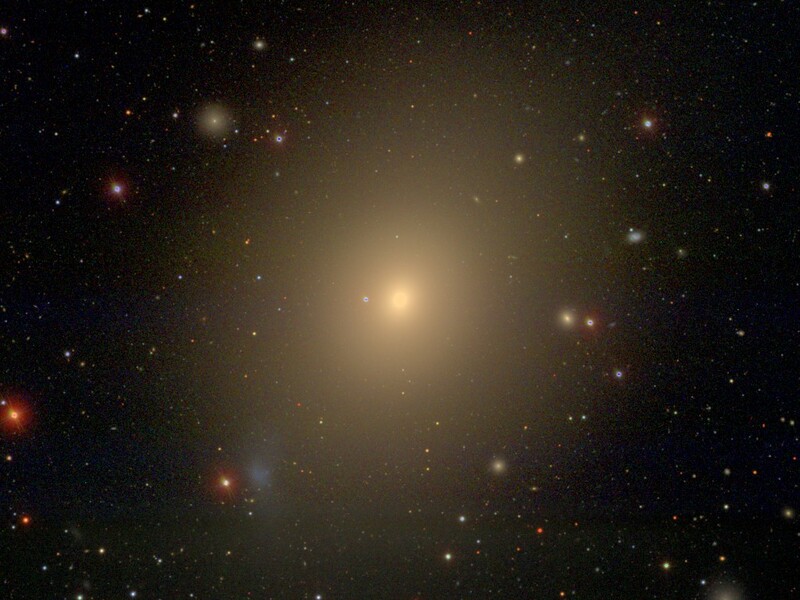 This galaxy is the most luminous member of the large Virgo Cluster of galaxies and, along with Messier 60 and Messier 87, it is one of the giant elliptical galaxies of this cluster. In fact, Messier 49 forms part of the smaller Virgo B subcluster, centered on the supergiant elliptical galaxy Messier 87. Messier 49 is gravitationally interacting with the dwarf irregular galaxy UGC 7636, which shows a tidal tail of 97,860 light-years long and 19,570 light-years wide. Nearly spherical, Messier 49 shows the smooth mostly featureless structure typical of elliptical galaxies. However, it looks like it has a bright central nucleus that fades away farther outwards. Messier 49 it is estimated to contain at least 200 billion stars, but has almost no gas or dust between its stars. Furthermore, the galaxy is very yellow, meaning most of its stars are redder and older than our Sun, implying that it’s been about 6 billion years or so since the last major episode of star formation took place in this galaxy, and it shows no evidence of recent star formation. Although far exceeded by the 13,450 globular clusters orbiting Messier 87, Messier 49 has a large collection of globular clusters, estimated at about 5,900. On average, the globular clusters of Messier 49 are about 10 billion years old. Messier 49 is classified as a Seyfert Galaxy. Seyfert galaxies are galaxies with extremely bright nuclei that produce spectral line emission from highly ionized gas. The centers of Seyfert galaxies have active galactic nuclei (AGN), and usually contain very massive supermassive black holes. Indeed, the nucleus of Messier 49 is emitting X-rays, suggesting the likely presence of a supermassive black hole with an estimated mass of 565 million times the mass of our Sun. And, between 2000–2009, strong evidence for a stellar mass black hole was discovered in a globular cluster of this galaxy. A second candidate was announced in 2011. The only (unconfirmed) supernova observed within this galaxy is designated SN 1969Q, and was discovered in June 1969. At the time of its discovery it had a maximum brightness of magnitude 13.0.